It looks as though Black Adam will finally be making his way to the big screen. Dwayne Johnson has been attached to play the DC Comics villain for a very long time, dating back to at least 2014. In any event, the character was originally supposed to be the main antagonist in Shazam, which opened in theaters rather successfully over the weekend. Instead, the baddie will get a solo movie first before the two characters square off. Now, Johnson has provided a little update, saying that the movie should go into production next year. Dwayne Johnson doesn't appear in Shazam, but he's still credited as a producer. As such, he took to Instagram to congratulate star Zachary Levi, director David F. Sandberg and the whole crew on their successful debut at the box office. During the video, the wrestler-turned-actor explained that this movie has been in the works for a long time, while also digging into how it was decided that it would be split into two different projects in the first place. "As we were developing this a few years ago... we were trying to tell two origin stories in one script. For those who know the comic books and the mythology of the comics with Shazam! knows that Shazam is connected to Black Adam. Black Adam is an anti-hero, or villain, who I cannot wait to play. I've been developing this and it's been with me in my DNA for over ten years now. We should start shooting that in about a year. Very excited about that." We first learned in January 2017 that The Rock had cooked up a plan to give Black Adam his very own movie. Shazam was being developed as its own thing at New Line even before the DC movie universe as we know it started to take shape. Since the time this project was initially conceived, Dwayne Johnson's star power has grown significantly, which, in part, probably motivated the decision to let him headline his own movie. Johnson further detailed how it came to be. "The challenges were, as you guys can imagine, when you're trying to tell two very big origin stories in the world of comic books, of this DC universe, two very important characters, trying to tell both of their origin stories in one script. I didn't think it was working. Finally, I called up Warner Bros. Toby Emmerich, my good buddy who runs Warner Bros. and I said, 'Brother, we have to split these stories and make two different movies.' He said, 'You know what, it is a great idea and let's do it.' So we rolled the dice. You never know with these things. I did feel in my gut that, out of respect to both origin stories, and those who know the mythology and the backstories of Shazam and Black Adam know that they are vastly different backstories." When last we heard, Adam Sztykiel (Undateable) was working on the Black Adam screenplay. No director has been attached, but there was some speculation that Andy Muschietti (IT) was circling the project, though that was never substantiated. Given the critical and fan response to Shazam, it might motivate Warner Bros. to make this movie a priority. For now, Black Adam doesn't have a release date, but Birds of Prey and Wonder Woman 1984 are slated for release next year, with The Batman and The Suicide Squad on deck for 2021. Be sure to check out the video from Dwayne Johnson's Instagram below. Hawkman and Stargirl to Be Introduced in Black Adam? Why The Rock's Black Adam Isn't in Shazam! What's Happening with The Rock's Black Adam Movie? 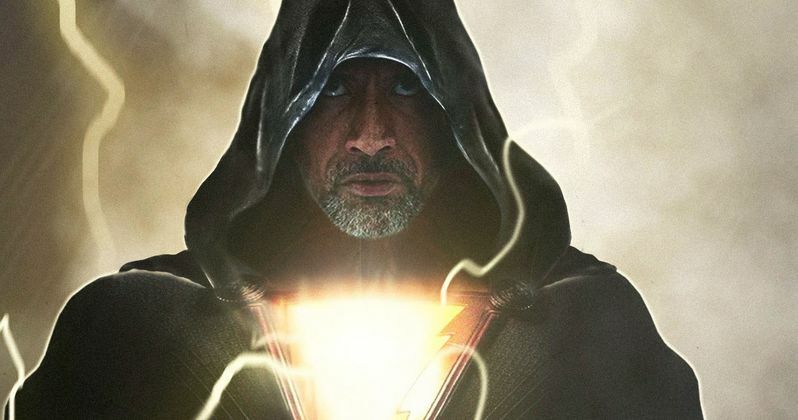 The Rock Says There's No Black Adam Cameo in Shazam!